SAINT LOUIS – Walter Mazzarri's team slipped to a 3-0 defeat at the hands of Real Madrid in the final friendly of their US tour, played at the Edward Jones Dome in Saint Louis this afternoon. Carlo Ancelotti's side established a 2-0 half-time lead thanks to goals by Kakà and Cristiano Ronaldo, then after the restart Alvarez was unlucky to put the ball into his own net and make it three. The Nerazzurri, who took to the field in a 3-5-1-1 formation with Fredy Guarin behind Rodrigo Palacio, responded well and took the game to the Spanish giants at various stages of the match. Inter's best chances came in the final quarter of the encounter through Palacio, Alvarez and Icardi, the latter particularly unfortunate to see his powerful header come off the bar. It's a disappointing result but Mazzarri will have seen plenty to be positive about nonetheless. 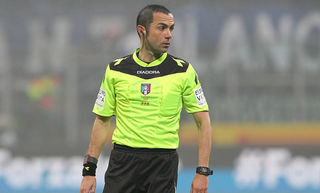 FIRST HALF – Real Madrid began the opening stages by keeping hold of the ball well, while the Nerazzurri looked to release Palacio on the break whenever possible. Los Blancos drew first blood 11 minutes in with the first real chance of the afternoon. A probing pass forward found Kakà, whose initial shot drew a great save out of Handanovic; the rebound fell kindly for the Brazilian and he headed Real in front. Mazzarri's men responded well to the deficit and began to retain the ball better and spend more time in Los Merengues' half. But it was Real who went closest to scoring the next goal when Casemiro picked out Morata, the youth academy product thankfully firing his volley over from just inside the box. Inter were set out well and closing down all the spaces, forcing Ancelotti's side to try their luck from range. However, in the 38th minute Real did double their lead. Casemiro's threaded ball into the path of Ronaldo was drilled clinically across Handanovic by the Portuguese and into the far corner. Palacio showed what a tricky customer he can be two minutes before the half-time whistle as he held off the attentions of a number of white shirts inside the box before poking the ball into the path of Olsen, only to see Dane guide his shot wide of the target. SECOND HALF – The Spaniards came out strong again in the second period and Jesé Rodriguez hit the bar within two minutes of the restart. Real remained in the ascendancy and Inter were forced to fend off several waves of attacks until Kuzmanovic's weakly struck attempt was easily saved by Lopez in the 66th minute. 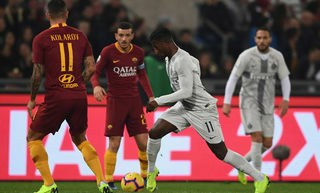 That was followed immediately afterwards by a mazy run from Jesé, Ranocchia making a crucial interception just as the 18-year-old pulled the trigger. The Nerazzurri carved out their first clear-cut opportunity shortly before the hour mark and Ranocchia was the instigator. The defender's excellent ball forward was expertly chested down by Palacio yet the Argentine could only lift his effort a fraction over the bar. Olsen continues to grow in stature and he showed that in the 63rd minute when he took aim from range: his powerful drive was heading for the top of the goal too until Diego Lopez clawed it behind for a corner. A series of circumstances contrived to give Real Madrid a third goal on 67 minutes. Carrizo came off his line to punch clear a corner that should never have been given; he failed to make contact and the ball bounced off Alvarez's head and into the Nerazzurri's goal. Ricky seemed determined to make amends immediately. In the space of two minutes he first went on a marvellous solo run, weaving his way into the box before shooting straight down the middle, before then seeing his right-footer saved by Lopez. Inter had clearly stepped up a gear at this point as they battled to reduce the arrears and a minute later Icardi's close-range header was cleared off the line. The traffic changed direction briefly with 12 minutes left on the clock and Carrizo had to be alert to thwart Morata's angled effort. Then came what was probably Inter's best chance of the night: Icardi rose imperiously to meet a cross from the right only to watch as his header smashed off the top of the bar. Inter weren't going to get any luck today. Lopez then denied Belfodil a chance for a late consolation goal when he kept out the striker's low effort from a wide angle in the 89th minute. Scorers: Kakà 11, Ronaldo 38, Alvarez 67 (og). Inter: 1 Handanovic (Carrizo 66); 14 Campagnaro, 23 Ranocchia (Andreolli 82), 5 Juan Jesus; 2 Jonathan (Nagatomo 74), 19 Cambiasso (Duncan 82), 17 Kuzmanovic (Alvarez 59), 90 Olsen (Mbaye 89), 31 Pereira; 13 Guarin (Belfodil 74); 8 Palacio (Icardi 66). Unused subs: 12 Castellazzi, 47 Capello, 93 Laxalt. Real Madrid: 25 Diego Lopez; 4 Sergio Ramos (Mateos 68), 7 Cristiano Ronaldo (Jesé 46), 8 Kaka, 15 Carvajal, 17 Arbeloa (Pepe 46), 18 Nacho (Casado 80), 19 Modric (Khedira 46), 21 Morata, 22 Di Maria, 26 Casemiro. Unused subs: 1 Casillas, 35 Jesus, 9 Benzema, 10 Ozil. 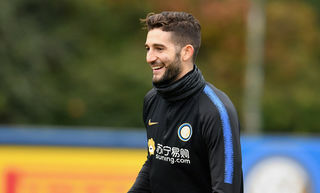 Gagliardini: "We need to pick up as many points as possible, starting from Roma"